The Most Reverend Edgar Moreira da Cunha, S.D.V., was installed as Bishop of Fall River on September 24, 2014, in the context of Mass at St. Mary’s Cathedral in Fall River. He was born in Nova Fatima, Bahia, Brazil, on August 21, 1953, the son of Manoel and Josefa Moreira. He attended local schools in Nova Fatima, Bahia, including the minor seminary (or Vocationary) of the Vocationist Fathers in Riachão do Jacuípe. There he joined the Vocationist Fathers, also known as the Society of Divine Vocations. He studied Philosophy at Universidade Catolica do Salvador, Bahia, Brazil, and Theology at Immaculate Conception Seminary, Darlington, New Jersey, graduating with a Master of Divinity degree. Bishop da Cunha was ordained to the priesthood for the Society of Divine Vocations, in the Church of St. Michael, Newark, by Bishop Joseph A. Francis, S. V .D., Auxiliary Bishop of Newark, on March 27, 1982. Following his ordination he served as a parochial vicar of St. Michael Church, Newark, and as director of vocations for his Congregation. In 1983, when the Archdiocese entrusted Saint Nicholas Parish, Palisades Park, to the Vocationist Fathers, Bishop da Cunha was transferred there to serve as parochial vicar and vice superior of the local community and at the same time continued his ministry of promoting vocations. During his time as vocation director he was very active and served on the board of the Eastern Religious Vocations Directors Association. In 1987 he was appointed pastor of St. Nicholas Parish. In 1992 he was elected secretary of the Council of the Vocationist Delegation in the United States. From 1994 until 2000, Bishop da Cunha served as novice master and director of the Vocationary, the house of formation that the Society maintains in Florham Park, N.J., in the Diocese of Paterson. He was appointed Auxiliary Bishop of the Archdiocese of Newark and Titular Bishop of Ucres by Pope John Paul II in June 2003 and was ordained a Bishop on September 3, 2003, at the Sacred Heart Cathedral Basilica in Newark. He became Regional Bishop for Essex County in that archdiocese in October 2003 and the archdiocesan Vicar for Evangelization in 2005. He was appointed Vicar General for the Newark Archdiocese on June 6, 2013. 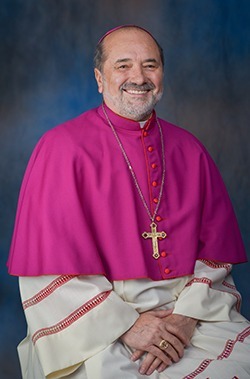 Bishop da Cunha served as a member of the Newark Archdiocesan Board of Consultors, the Presbyteral Council, the Clergy Personnel Board, and the New Jersey Catholic Conference (NJCC) Board of Bishops and was chairman of NJCC Public Policy Committee. He was also chairman of the Newark Archdiocesan Implementation Team for the New Energies – Parish Transition Project. At the U.S. Conference of Catholic Bishops, he has been a member of the Committee on Cultural Diversity in the Church and Committee on Migration, and he currently serves as a member of the Administration Committee; Committee on Priorities and Plans, Sub-Committee on the Church in Latin America; the Sub-Committee on Pastoral Care of Migrants, Refugee and Travelers; and the Sub-Committee on Hispanic Affairs; and as Episcopal Liaison to the Brazilian Apostolate in the U.S.
Pope Francis appointed Bishop da Cunha to be the Eighth Bishop of Fall River on July 3, 2014. As the leader of the Fall River Diocesan Church he shepherds a community of faith of approximately 269,000 persons who worship in 81 parishes throughout Southeastern Massachusetts, Cape Cod and the Islands.